MANILA, PHILIPPINES — There has been a lot of excitement about the 2nd generation of Ryzen processors but now the wait is over. 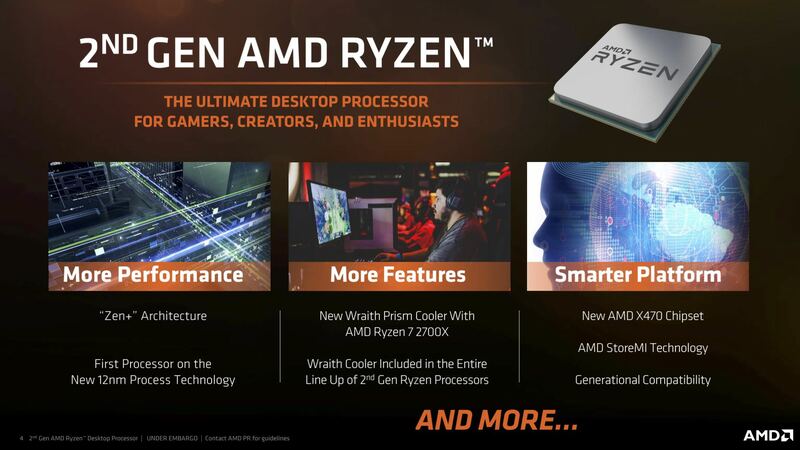 At the time of this posting (April 13, 2018 EDT), the 2nd Geneneration Ryzen processors are now available for Global pre-order and shelf availability will be on April 19. The 2nd Gen. AMD Ryzen Processors line up are as follows: Ryzen 7 2700X , Ryzen 7 2700, Ryzen 5 2600X, and Ryzen 5 2600. When the AMD “Zen” architecture was first introduced, it was presented as an all-new “clean sheet” design that brought a new standard for AMD processors with clock speeds up to 4GHz boasting a highly parallel 16-thread design, large 20mb cache pool, and wide instruction-level parallelism. The Ryzen processors has proved that they perform well in creative work loads like 3D modelling, video rendering, and video editing. However, the said processors fell short in terms of gaming and single-core performance. Nevertheless, AMD has spent a lot of time listening to their users feedback to further improve the Ryzen processor line up since the launch of Ryzen processors last year. Now, they have created some of the best CPUs for gamers, creators, and enthusiasts. Codenamed “Pinnacle Ridge”, the 2nd Generation of Ryzen processor allow PC enthusiasts to have an opportunity to experience a very well-nrounded platform for their computing needs. In a nutshell, its faster access to cache and memory, plus a higher IPC, establishes a Ryzen design that is better equipped to meet the performance users demand, particurlarly gamers. 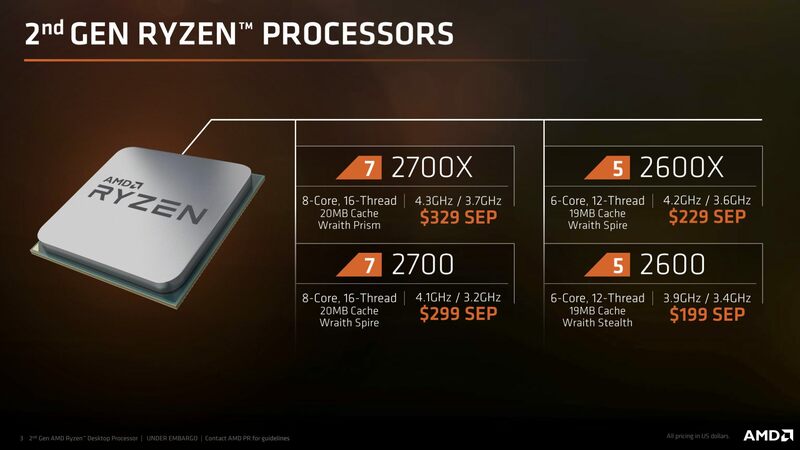 Furthermore, the “Zen+” architecture takes advantage of the 12LP process which offers transistor performance better than preceding nodes, which extends the clock speed range of and reduces required voltage of the Ryzen design allowing the processors to have +300Mhz clock speed, reaching up to 4.3GHz in everyday operation. There is also a 50mV reduction in core voltage across the operating range vs. 14nm so all cores can have higher overclocks. 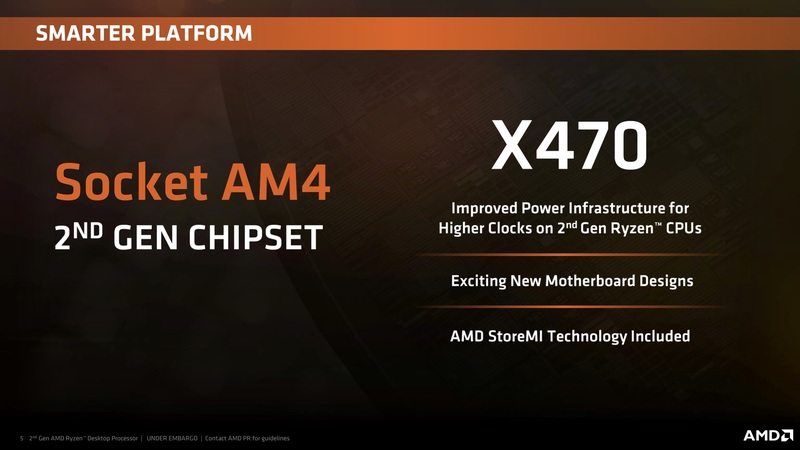 If you have invested on a premium X370 motherboard already and you want to upgrade, it is good to note that these new processors will have backwards compatibility as the AM4 socket is designed to have longterm support for upcoming Ryzen processors. The upcoming X470 Chipset will provide improved power infrastructure for the higher clock speeds of the 2nd Generation Ryzen CPUs and it will also feature a new storage acceleration technology called the AMD StoreMI Technology which hypothetically fuses a solid state drive to a hard disk drive for storage acceleration without requiring to reinstall Windows. The AMD StoreMI Technology can be enabled or disabled easily without hassle. AMD is also introducing a new CPU cooler called the Wraith Prism, which will be bundled with the higher tier Ryzen 7 2700x processor. It features switchable fan profiles and three independent RGB Zones. This quiet 39dBa cooler will provide superior cooling performance allowing headroom for overclocking. The key takeaways of the 2nd Generation Ryzen processors are the significant performance increase in creative workloads, stronger gaming performance 1080p and 1440p equivalent to their competitive counterparts, user-first amenities like: AMD StoreMI, quality CPU Coolers, premium copper IHS soldered to the processor, the AMD Ryzen Master software and unlocked multipliers. The 2nd Generation Ryzen processors have arrived at our H.Q. and we will be doing testing in the coming weeks so stay tuned for further analysis and individual reviews.